1 Fifteen people have intentionally gone over Niagara Falls. Some of them have gone in or on a device. Only a handful have lived to tell about it. Those who survive the Falls are often called daredevils. Those who don't are called deceased. 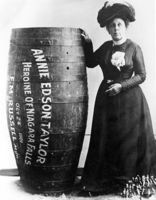 2 The first person to survive a trip over Niagara Falls in a barrel was a woman named Annie Edson Taylor. She celebrated her forty-third birthday by going over the Falls. 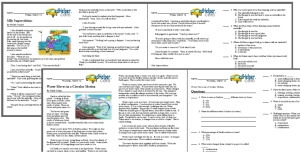 3 Why would a woman her age want to go over Niagara Falls? She needed money. 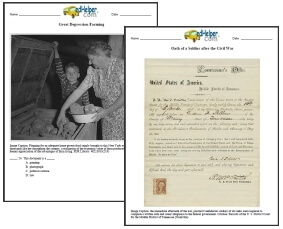 Annie was a widowed schoolteacher from Michigan. She had lost all her money twice. She was nearly penniless. There were few opportunities for women to earn money then. Annie felt that her future looked bleak. She wanted more than her teacher's salary to sustain her. She believed being the first person to take a trip over the Falls in a barrel would bring her fame as well as fortune. 4 The barrel was made especially for the stunt. It was made of oak and padded with cushions. It was four-and-a-half feet high and four feet across. It was a tight fit for a grown up. A pair of leather shoulder straps was fastened inside to serve as a harness. The empty barrel weighed 160 pounds. Annie also weighed 160 pounds. Could it have been just a coincidence that the Falls were also 160 feet high?